Hey, what’s going on everyone? 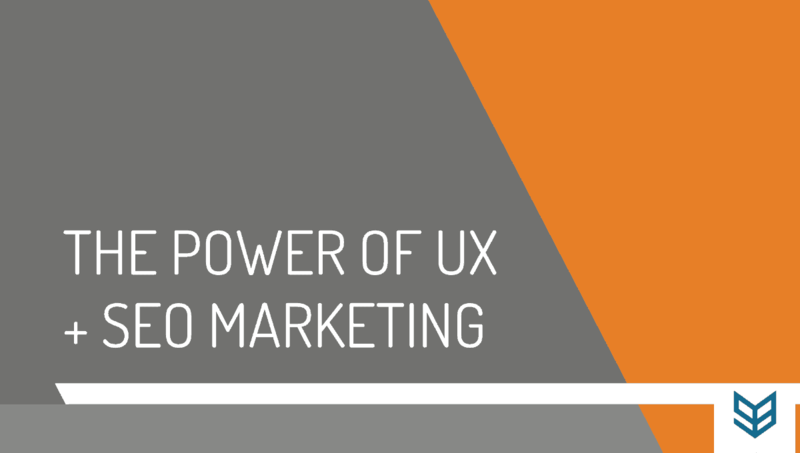 This is Chris from StrategyBeam and today let’s take a look at the power of UX and SEO Marketing. The first thing we want to look at is the relationship between Search Engine Optimization and User Experience. As part of an active SEO marketing strategy, SEO & UX are the future of digital marketing. Understanding how UX and SEO work together to help you achieve your business goals is one of the most important aspect to create a valuable marketing strategy. In the past, SEO was all about gaming the system. Much of SEO marketing in the past focused on how to manipulate algorithms to make Google and other search engines rank content. This was usually done with black hat strategies, and as a result was the first thing that many marketers thought about SEO first, and UX was the second priority. UX was not thought about until after the SEO strategy was made, but SEO and UX are changing, because how people are looking for content are changing too. This pattern is seen in the business model of Google. As the driving force behind Google, this giant company currently employs thousands of psychologists and engineers to help bridge the gap between what people are looking for their search engine, and the answer is that’s out there on the Internet. This means that your business needs to consider what Google is focusing on if you want your content to rank in their search engine and get found by potential clients. As we discuss this topic you should consider whether you are creating a website from scratch or if you have an existing SEO strategy and/or website. If you have an existing website or SEO marketing strategy then you will need to conduct a website audit for your business. Understanding the content that you have is essential to identify ways to improve how your site reaches and engages your customers. Search engines by default seek to evaluate the quality of content. This is where SEO and UX come together. Many people believe that SEO and UX seem entirely a bit different from one another. When people think of SEO marketing, they think of robots, technology. When people think of UX, they guess strictly about user experience on a website. Even though these two specialties seem entirely different, in reality, they have quite a few shared interests. Let’s take a look at the shared interests between these two schools of study to see how they can work together and build your online marketing presence. The first thing that’s similar to Search Engine Optimization and User Experience for your business is that both elements seek to drive qualified leads to your site. The bottom line is that SEO and UX strategists employ different approaches to make great content, but both approaches are focused on increasing conversions and driving sales. Making more money is the most important factor for the overall success and health of your business. If you don’t make money, you won’t stay open, and if you’re not driving qualified leads that turn into customers on your site, then you won’t stay in business for too long. SEO is meant to help you get found online to drive qualified traffic, and UX is meant to convert that qualified traffic into paying customers. By using SEO and UX together, you’ll be able to find ways to improve your website and drive more sales through a profitable SEO marketing strategy. Search Engine Optimization and User Experience are essential mediators between search and humans. When people go to Google, they ask questions; then they find answers on your website. Once they find those answers, they convert. As we look at the similarities between SEO and UX, we should think about the role of Search Engine Optimization, and what does SEO seem to accomplish? The first thing that SEO marketing does is that this approach improves findability of your content online. You want to rank higher in Google and other search engines to get more clicks and get more traffic. SEO is all about driving qualified traffic, so understanding the WHO, what, when, where, why of your searchers is vital. If you want to drive qualified traffic and you do this by having targeted keywords around the needs of your customers. This is a user, and this comes down to them to the core of what SEO is. So the bottom line is SEO is all about turning searches into visitors, and this is quite similar to the role of UX. What does user experience look to accomplish? What Is The Role Of UX? 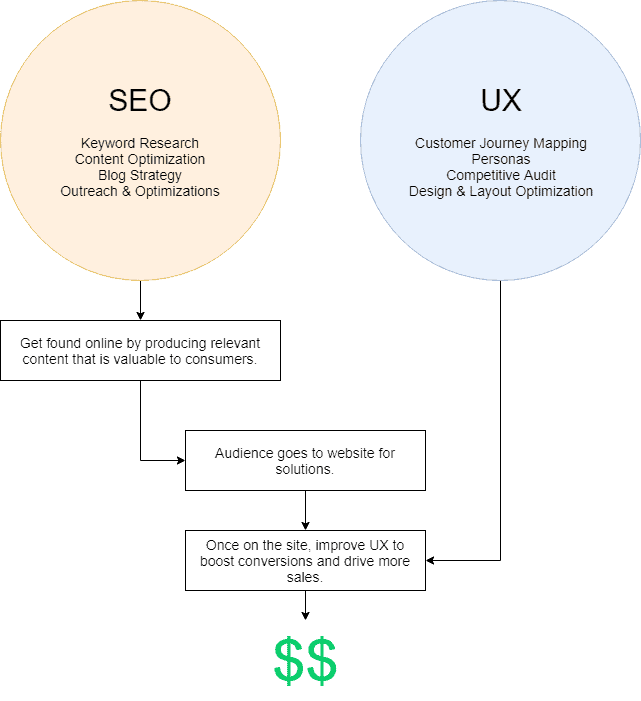 We can see that the purpose and roles of UX and SEO are quite similar to each other. User experience is meant to improve site usability of content on your website, whereas SEO was meant to improve findability of your content online. UX focuses on the website experience for your customers once they reach your site since SEO is about driving qualified traffic to your site. Once they’re on your site, how do they interact with your website? How do they convert, where do they go? You can find all these issues too in Google Analytics by looking at the paths that people take from what pages they go to, where do they drop off, and then also looking to experience looking at the experience of your target persona. There are other approaches that you can take to identify areas to improve UX on your site so you can convert more customers and make more sales. This comes down to understanding your target audience and what their needs are, and then optimizing your website around the needs of your consumers. Since SEO is all about turning searches into visitors, User Experience and SEO marketing are about turning visitors into customers. SEO focuses on driving traffic, and User Experience focuses on converting the traffic that SEO makes to your site into paying customers. These two elements of your SEO marketing strategy have to work together if you want qualified traffic on your website that converts to paying customers. If you’re going to drive sales and improve your overall rankings online at the same time, then you can see how this entire process is a holistic process and system. 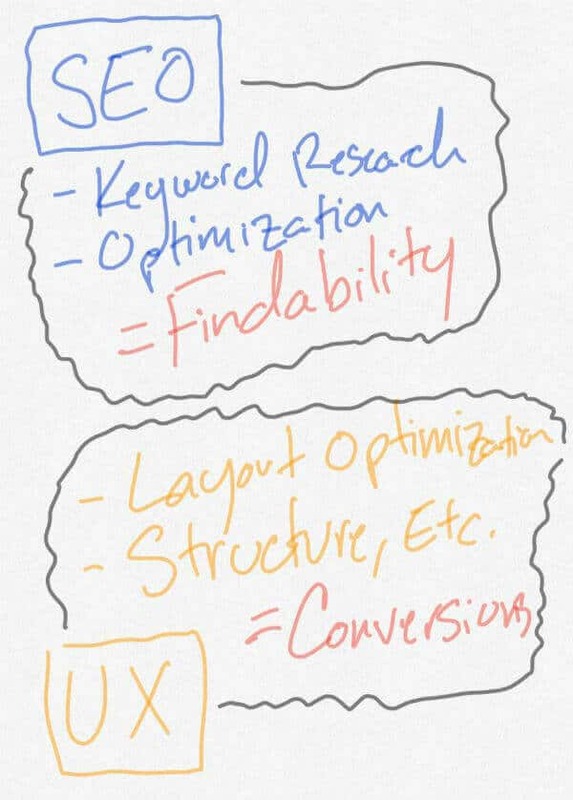 We looked at what SEO is, what UX is, how they work together, what they look to accomplish, but how do you optimize SEO and UX on your website? Well, it’s not easy, but here are a few points that you can use today to help optimize your website for both SEO and user experience with the ultimate goal of improving your sales. This is understanding who your target audience is, and this is the foundation of any good Search Engine Optimization strategy or User Experience optimization strategy. If you don’t know who your target audiences, then you don’t know what their needs are. If you don’t know what their needs are, then you don’t know what they’re going to look for online. If you don’t know what they’re going to look for when they search for you then your business you can’t rank for relevant keywords and terms to get found. In the same way, once you capture qualified traffic on your site, you need to convert that traffic. If you don’t know what they’re looking for, then you can’t optimize. Or even worse, if you don’t know how they’re looking for your content, you need to optimize for that as well. If you don’t know the search intent of your audience, then you won’t be able to optimize your content to get found on Google or other search engines. Nor can you optimize your website to increase conversions because your customers will not be able to reach your site! So, it boils down to developing an intentional SEO marketing strategy. Your small business and startup need to start with your target audience in mind. Once you understand who your target audience is, you will be able to select the right keywords to draw the desired traffic to your site. Once you understand why people are looking your products and services and what they’re looking for, you need to design your website to help your consumers reach their goals. Remove excess links from your pages that don’t direct customers toward your purchase page. Format content on your website for easy navigation. Optimize your content to get found and convert your readers. Use bullet points throughout your content for easy consumption on mobile devices. Once you take all these actions to drive qualified traffic and boost conversions, you can’t stop improving either your SEO or UX marketing strategy because the needs of your customers are constantly changing, as is the competition in your market. SEO marketing is not a set it and forget it strategy either you do have to track metrics, you have to track your audience. Where are people coming from when they come to your site? Where do your customers go to your site to find information? How long will your customers stay on your content for? Where are they going from page to page, where are they dropping off? Once you have the desired metrics, you need to keep testing based on what you are measuring and how it is working towards the goal of your business. You have to conduct A/B test in format, design, content, and colors. Your business should update design concepts based on who your audience is and test conversion rates for various approaches and layouts. Technical SEO strategies interconnect with UX optimizations when your company works to create a great online experience for your audience. One way many companies overlook this is by not optimizing their internal linking structure. Be sure to consider not just what your content says, but also how your content is structured on your site. Always change your website content and never be afraid to change the design. Don’t be married to anyone layout anyone designed because it might not work, and the bottom line is you’re not here to make your website look good. You’re here to make money. Making money is the bottom line and ultimate goal for your business, and you could do that with a great looking website. However, if your content does not address the questions or needs of your customers then you won’t be found online. On the other hand, if your website is not set up and optimized to convert qualified leads that come to your site, then you won’t be able to boost your Conversion Rate. If you have any questions about this topic, feel free to check out our website, and we’d love to continue the conversation with you there. So until we talk again about the next video of ways to improve with SEO Copywriting, we look forward to speaking with you soon.